Entering downtown Campton from the east on Main Street, it’s hard to miss the Wolfe County FB office. Adorning the side of the building facing west is an eye-catching 8 ½ X 44-foot mural depicting farm and rural scenes from Wolfe County, where some 600 farms are scattered among the Appalachian foothills. The mural depicts farm and rural scenes from Wolfe County. The artwork is part of a community development project spearheaded by Wolfe County FB Directors George and Pam Pilgrim and made possible by the creativity of local artist Linda Harse-Lancette. 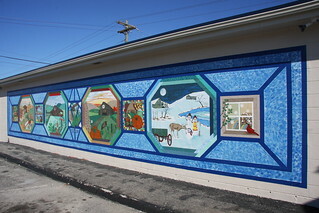 She designed the nine-panel mural after several weeks of observing various scenes throughout the county, and then supervised the painting project in which 28 volunteers worked a total of 284 hours over a 27-day period culminating last September. The project was sponsored by the Downtown Campton Renaissance Alliance, which is chaired by George Pilgrim. Pam Pilgrim, who is Vice President of Wolfe County FB, moved things forward by putting together a grant application submitted to the Brushy Fork Institute at Berea College. The grant was approved through the Appalachian Regional Commission to support a community enhancement project. Pam, who coordinated the project, then enlisted Mrs. Harse-Lancette to come up with a design, conduct required workshops and oversee the painting. Mrs. Harse-Lancette is a New York native and former Art teacher. She and husband Bernie moved to a Wolfe County farm from Syracuse in 1998 to lead, as she put it, “a quieter life.” She has a business, “Art Naturally,” involving various types of art, including gourds, wheat weaving and egg art and carvings. She said she got the idea for the panels and borders from a quilt show in Paducah. A schedule was set up for the various participants to take their turns painting. The group included County Judge-Executive Dennis Brooks and Wolfe County Schools Superintendent Kenny Bale, as well as the entire Wolfe County FB Board. To prepare for the mural, the surface was power-washed. And the building also received fresh paint, a new porch and sidewalk. “This was basically a learning thing that helped us dress up the building,” said Wolfe County FB President Carroll Amyx, who also serves on the KFB Board of Directors. The mural is lighted at night. Pam Pilgrim said the project is a source of great pride for Wolfe County FB, but is not an uncommon achievement. Wolfe County FB also is selling prints of the mural to raise money for a local animal shelter. Coincidentally, the mural was completed just prior to the dedication of a sparkling new Wolfe County Judicial Center which is nearby on Main Street.